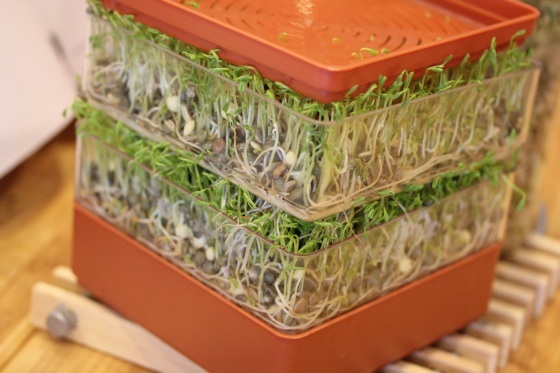 The lentil sprouts in the tray sprouter are pushing the trays apart! Those are mung beans in the jar sprouter and when I started them on Sunday, they were just a couple of tablespoons of dried beans on the bottom not even taking up 1/8 of the jar! 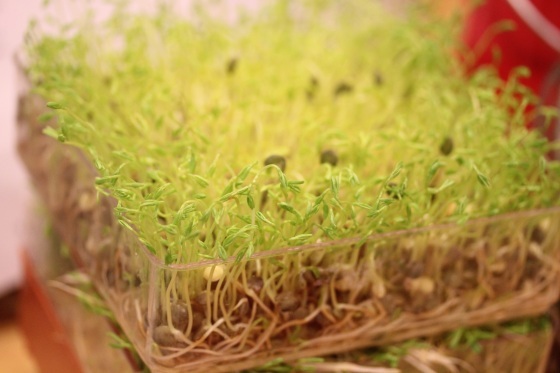 The roots of the lentil sprouts are even sticking out now. But they’re such a gorgeous green color with cute little leaves. And they’ll be part of a huge salad for our Easter family gathering Sunday. After this week, I was happy to go out for a relaxing dinner with hubby. Nothing like a relaxing evening with great food and a bottle of wine to ease a horrible week. 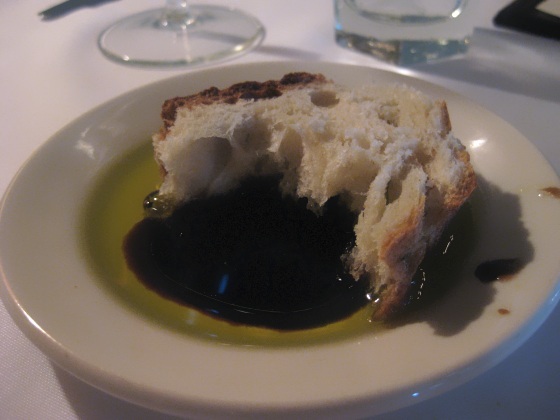 But we weren’t too adventurous going to one of our favorite Italian places – Il Fornaio. 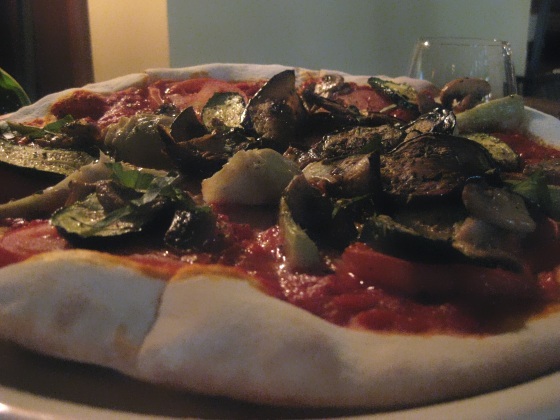 Yup, we’ve been there before, a few times actually and I got the same vegan dishes I usually get because they’re wonderful and the service is always wonderful. 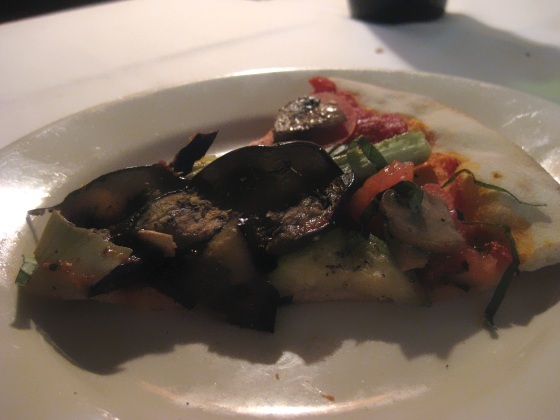 Like the last visit, I got the vegan bruschetta and pizza. But it made an interesting opportunity since I only had my point-and-shoot camera this time and my DSLR on a previous visit taking pictures of similar dishes. 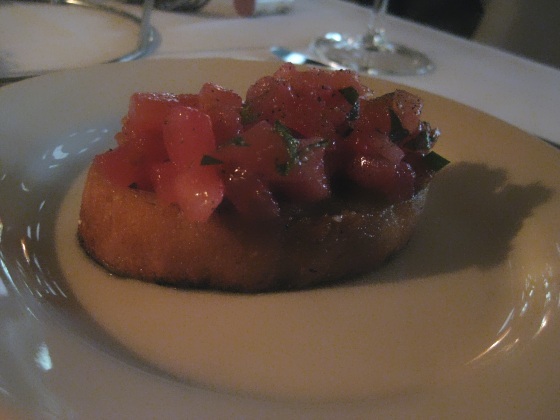 My point-and-shoot is a Canon PowerShot SD1100 and I usually snap food shots in digital macro mode which has drawbacks in low-lighting, and the flash is useless for close-up food shots. My digital SLR is a Canon Rebel T2i and I usually shoot food with a macro lens. The difference in pics is incredible! I had to edit the SD1100 point-and-shoot pics adjusting the brightness, contrast and noise level and still they look like crap compared to the digital SLR! Obviously my photography skills have plenty of room for improvement, but these pics were shot in the same lighting without flash and there’s a night and day different in the color and clarity, enough to make me want to carry the DSLR everywhere … if it wasn’t so heavy. It was a wonderfully relaxing evening and I’m looking forward to a fun relaxing weekend and spending time with family for Easter. What are your plans for the weekend? Wow the diff in pics is stunning! As we all know, the quality is just so much better with a dslr but seeing it side by side is a great reminder. As are the sprouts. Why do i only remember that I need to do them…when I see them on your blog? haha! So glad you like the lens, it’s awesome in low-lighting and does so much better for eating out. Too funny on packing, I’m gonna be facing that soon too and looking for a good carry on to hold my laptop, camera and lenses. So funny you posted this, I have to get a point and shoot! I hate the hassle of lugging my DSLR everywhere too! I know though, the DSLR just rocks the best! i meant htose comparison pics show it all! What macro lens do you have for your canon, I think i already asked you this, sorry! Happy Easter to you and the family! SOunds like from what you wrote on my blog, you have a fun day planned!! 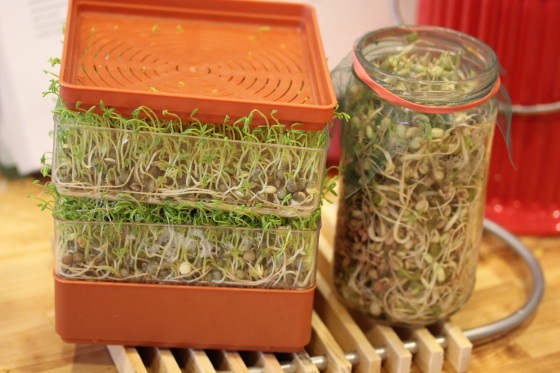 I’m so impressed you have the energy for sprouting. Kudos.